Should I feed lab block? Which one should I choose? There are certainly some options for feeding your rats that do not involve blocks, but good quality blocks are a healthy way to ensure they get proper nutrition. While many people have their own opinions, it is generally accepted that the two premium food block brands for rats & mice are Harlan Teklad and Oxbow. For some additional information on feeding blocks, take a look here. 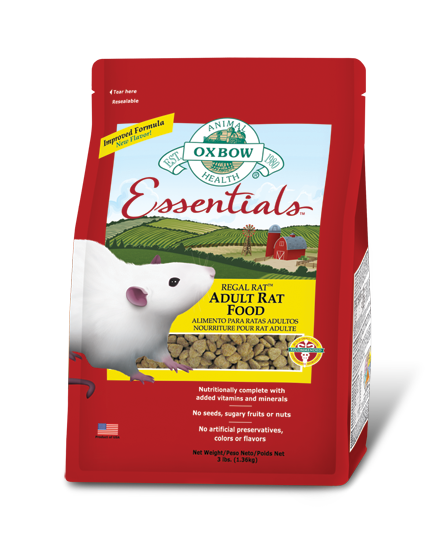 Oxbow Regal Rat is considered to have the best ingredients and is easier to find but the low protein content is not sufficient for younger rats. Younger rats would need supplemental protein. 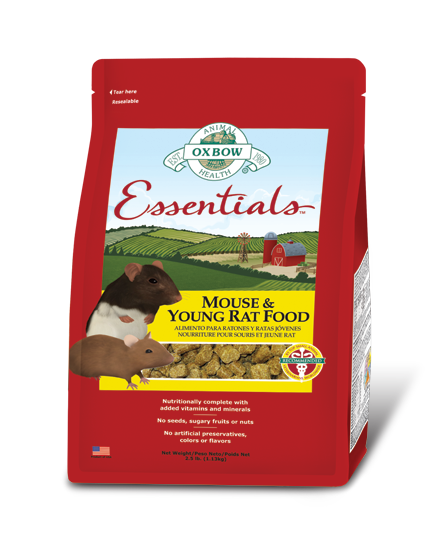 Oxbow Mouse & Young Rat would be appropriate for younger rats (6 months to a year old) as it has the increased protein they need. 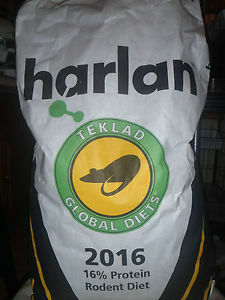 Harlan Teklad is designed for laboratory use where they need a premium food with no variables that would skew whatever it is they are studying. As such, it is a high quality food that supplies what rats need. There are a number of different formulations of Harlan Teklad. There are four formulas that are most commonly fed to rats. 2014 (14% protein for elderly or obese rats), 2016 (16% protein for adult rats), 2018 (18% protein for juveniles up to 8 months old), and 8604 / 8640 (soy-based at 23% protein for nursing mothers). There are two camps on soy out there, one saying soy is excellent at reducing mammary tumors in females, and the other saying soy (probably GMO soy) causes cancer. So, if you choose to feed the 8604 / 8640 it would really only make sense for non-spayed females. HT is harder to find, mainly because it is only sold in large amounts ($1000 minimum), typically to labs. Where there is a large concentration of rat owners, sometimes they go in together on a large order. Other than that, various rescues will order and then separate out the bags into amounts that can be shipped to individuals. The Crafty Rat will fit a full 20lbs of HT in a flat-rate shipper. If you're worried about not using it before the expiration date (she marks on each bag), you can always freeze some of it. The 20lb order is the most cost effective though there are smaller quantities available. To compare prices, as of January 2014, it's $38.85 total for 20lbs of HT including shipping to PA. That's $9.71 for 5lbs making it quite price competitive for a premium food. Your drawback? You have to plan ahead a bit so you don't run out. As a last resort use Kaytee Forti-Diet. Not the greatest, but at least it is a block food rather than one of the rodent mixes. The mixes are poor choices, if for no other reason than the rats will pick out the "good" stuff and leave the healthy stuff behind. Many also contain dried corn which could be carcinogenic. That being said, a premium food is highly suggested. It does noticeable wonders for them. Besides all the good stuff going on inside your rats, you will notice a much softer, shinier coat usually very quickly. Often you may even notice your rats smell better. Not rat waste, their actual scent seems to improve. Plus, you get the pleasure of knowing you are providing some of the best nutrition available, and you are quite likely reducing the amount you may need to visit a vet.